In the last 10 years the digital advertising space exploded with the growth of DMPs and DSPs, giving digital marketers new ways to find and attract audiences. In the last few years, the market has shifted again with the introduction of CDPs giving marketers a new and powerful tool to augment and supercharge existing services. This webinar will walk you through what each service does, when you should consider using it, and best practices for combining them together. Using a CDP to personalize marketing on the channels that really matter. For the last several years, pundits have predicted that THIS would be the year mass personalization takes off. Industry giants like Facebook and Amazon have been held up as shining examples of how to personalize at scale. But is this level of personalization really needed for all companies on all channels? In this talk we’ll share personalization industry benchmarks collected from marketing leaders from global 2000 companies to help better define what’s working, what’s not, and how a CDP can be used to maximize personalization results on the right channels that matter for your business. The future of personalized shopping experiences is upon us. Retail and eCommerce leaders are using online and offline data to create better personalized experiences to disrupt their peers. IoT data like RFID sensors, smart screens and augmented reality are being smartly incorporated allowing forward-thinking retailers to leapfrog their competition in the next decade. 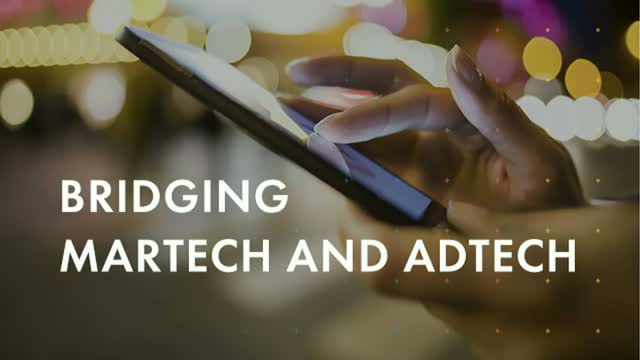 In this session we’ll explore the technologies that make this possible and look at a few real world examples of how data-driven strategies are being implemented by retail leaders Subaru, Muji and Kirin. • How "Boomers", "Gen X" and "Millennials" view the trust vs personalization relationship and what segments companies are most commonly using for personalization today. You may have heard of a Customer Data Platform (or CDP) but really not understand what that means or what functionality to expect. Join us for this webinar to learn about CDPs from how they help you manage your customer data, to how they’re architected, what use cases they serve, and what to look out for when selecting a CDP vendor. Digital marketers who use Facebook ads have noticed a drop in organic and paid reach due to the algorithm changes. This has resulted in ad costs rising and overall reach decreasing, a bad situation for any digital marketer. Join our Director of Solutions Engineering as he demonstrates how using a Customer Data Platform (and the first party data you already have) with Facebook custom audiences can increase your reach and decrease your costs. Marketers today are dealing with more customer data than ever before resulting in large MarTech solutions each with their own analytics and visualization. This leads to a huge amount of confusion and manual work for marketers when reporting on the success of lead gen, advertising campaigns, email outreach and events. Learn how to streamline your reporting and up-level your visualization with a hands-on webinar with Arm Treasure Data and Chartio as they walk step-by-step for the best marketing KPIs to tracking and how to setup your own Ultimate Marketing Dashboard. This webinar will include both a high-level overview as well as technical explanations for some of the most advanced charts we've built. Disruption from a few data behemoths has forced the retail and eCommerce companies to innovate and retrain themselves to be data-driven or risk falling behind. Join us as we look at how 4 different companies including Japan’s #1 beer company, a global beauty brand and a brick and mortar retailer are blending online + offline data to predict and influence customer journeys. We'll also look at how digitally native eCommerce site, Wish.com, used data to beat Amazon and become the #1 mobile shopping app. Retail, CPG and eCommerce executives, marketing operations, digital marketers, or data analysts who want to learn how a startup founded in 2011 beat Amazon to become the #1 shopping app on iOS and Android. Marketing tools operating individually in your martech stack offer very limited business value, if at all. Now, with the emergence of Customer Data Platforms, Marketers no longer have to rely on IT to get the data connection and answers they need. This hands-on webinar will show non-technical marketers how use a Customer Data Platform to easily populate a Marketo list, and return the campaign results from Marketo for more accurate campaign analysis or segment refinement and re-targeting. The new GDPR regulation goes into effect on May 25th. While a majority of conversations have revolved around the security and IT aspects of the law, marketing teams will play a crucial role in helping organizations meet GDPR standards and playing a strategic role across the organization. Join us to learn more, engage with your peers and get prepared. - A deep dive on how GDPR regulations will affect your marketing channels - email, programmatic advertising, cold calls, etc. We’ve all seen the explosion of marketing technology companies over the past several years, clearly illustrated in Scott Brinker’s Marketing Technology Landscape that grew from 150 companies in 2011 to over 5,000 last year. Today, we’re seeing many marketers who have been part of the martech tool buying spree in recent years take a step back and assess both how their stack works together and if they’re getting ROI from each piece. On the other hand, exciting developments in Artificial Intelligence (AI) have added capabilities and enhanced others. So how do we make sense of the martech landscape today? How do you build a stack that answers business needs and takes advantage of cutting edge technology? The new GDPR regulation go into effect on May 25th. While a majority of conversations have revolved around the security and IT aspects of the law, marketing teams will play a crucial role in helping organizations meet GDPR standards and playing a strategic role across the organization . Join us to learn more, engage with your peers and get prepared. Disruption from a few data behemoths and agile startups has forced the retail, CPG and eCommerce industries to innovate and retrain themselves to be data-driven. Join us as we look at two repeatable success stories about how Wish decided to use their data to close the data gap and give their customers an excellent mobile shopping experience. With AR and VR technologies, it’s the first time that data collection has been part of the front-end strategy vs back-end process. As companies compete to create new, interactive experiences, data is the tool of choice to measure all aspects of player engagement and marketing effectiveness. In this webinar, two industry experts, Nicolas Nadeau and Andrew Mayer, will talk about the trends driving AR and VR markets today, and what data-driven approaches companies need to think about to compete in these markets tomorrow. Multidisciplinary entrepreneur who has been working in the gaming industry for more than 15 years, Nicolas produced video games for Ubisoft, Disney and Gameloft with his first company in 1999. He then joined the ranks of EA followed by Ubisoft as an economic designer and producer. He founded exostatic.com 5 years ago and worked with major clients such as Microsoft (US), BBC (UK), Hoplon (Brazil) & Warner Brothers. Amongst others, Exostatic is notably in charge of the complete app data pipeline for Mattel as well as analytics for one of the leading VR game developers, Survios. His unique insights on gameplay, platform, and player interaction have translated into highly successful projects in a variety of mediums, from tabletop to television (and everything in-between). During that time Andrew has worked with numerous companies including Sony, Time Warner, EA/Bioware, and Telepictures Productions. He has integrated interactive experiences with major intellectual properties, including Batman, Tonka Toys, Reader Rabbit, The Ellen Show, and much more. Andrew currently works as a consultant and teacher, helping students and companies create more powerful interactive experiences through the effective integration of play, content, engagement, and monetization across numerous platforms, including mobile, VR, and AR. Companies with multiple products often struggle to calculate accurate Customer Lifetime Value (CLTV) across their portfolio. This is because user data is often analyzed in silos so companies are unable to get a clear picture of ROI and CLTV across platforms, devices and apps. In this webinar we’ll look at how you can apply a holistic and complete approach to your CLTV and ROI through the lens of gaming companies, though this technique is applicable for any company who has products spanning platforms. How the integral power of data in business has shifted over the past 10 years. Discover the current technologies and processes used to analyze data across different platforms by combining multiple data streams, looking at examples in brand and portfolio-based LTV. How to process and centralize dozens of varying data streams. Nicolas Nadeau will speak from his extensive experience and show how leveraging data from multiple product strategies spanning many platforms can be highly beneficial for your company. Do you know what your top ten 'happy' customers look like? Would you like to find ten more just like them? Come learn how to leverage 1st & 3rd party data to map your customer journey and drive users down a path where every interaction is personalized, fun, & data-driven. No more detractors, power your Customer Experience with data! If you are working on an AI project, drop it. Chances are good that you don’t have AI problems (yet) but instead have data challenges. In this webinar, we will share what we learned from running a large data platform ingesting 2 million data points/sec and running 7 million queries for hundreds of enterprises. We will focus on the problems that you can tackle on Monday so that you are best positioned for next year and beyond. The reality is virtual, but successful VR games still require cold, hard data. For wildly popular games like Survios’ Raw Data, the first VR-exclusive game to reach #1 on Steam’s Global Top Sellers list, data and analytics are the key to success. And now online gaming companies have the full-stack analytics infrastructure and tools to measure every aspect of a virtual reality game and its ecosystem in real time. You can keep tabs on lag, which ruins a VR experience, improve gameplay and identify issues before they become showstoppers, and create fully personalized, completely immersive experiences that blow minds and boost adoption, and more. All with the right tools. Make success a reality: Register now for our latest interactive VB Live event, where we’ll tap top experts in the industry to share insights into turning data into winning VR games. Data Management Platforms (DMPs) have helped marketers improve digital advertising in the last 10 years by providing easy access to 3rd party global audience segments, but smart marketers have realized that this isn’t enough. Modern marketers are now looking for ways to incorporate 1st party data into their entire marketing strategy but the problem is that this data is frequently siloed and challenging to access/analyze fast enough to keep up with market demands. The solution is a Customer Data Platform (CDP) which is a new system - recently recognized by Gartner - that works in harmony with existing marketing technology to connect internal 1st party data, with external 2nd or 3rd party data. - How to leverage your most valuable asset - 1st party data - to maximize your programmatic advertising impact. - Gain a deep understanding why it’s crucial to unify 1st party data for holistic customer insights as well as activation. - Why a Customer Data Platform is essential to integrate 1st party data with your Data Management Platform. Treasure Data and Chartio have come together to make your data connected, real-time and easily accessible. Analysts will learn about tools to combine and automate complex workflows to get new insights faster. Business leaders will learn about how Live Data will give them a competitive edge with a 360 degree view of all business data. Engineers will learn how they can abstract mundane / routine data access requests to focus on building apps that support the business. Arm Treasure Data enterprise Customer Data Platform (CDP) unifies data from multiple sources - online, offline, IoT and device generated data - and empowers enterprises to disrupt their markets with superior customer experiences. Our customers are creating transformational customer relationships by connecting the data dots with our CDP. Arm Treasure Data is fully owned by Arm Holdings and has a global customer base of over 300 enterprises including Fortune 500 and Global 2000 companies. Our clients manage over 130 trillion records, resulting in more predictable and profitable business results.